What do you picture when you think about how you want to spend the next several years? Do you crave adventure or comfort? Do you want peace and privacy, or an active social life? Which hobbies are most important to you? Do you have any health issues that mean you’ll need some help to continue pursuing those hobbies? The best senior living community is one that addresses the discrepancy between your goals and your needs. For example, do you love gardening but struggle with chronic pain? Then you might be happier at a beautifully landscaped apartment that provides enough space for a small indoor garden. A clear, detailed outline of what a happy retirement looks like is the first step on your search. Knowing what you want means you’ll be less vulnerable to flashy advertising and pressure from loved ones. Every senior is different, so the perfect community for someone else might be the worst possible choice for you. Know your needs. Honor them. Demand that the community you choose can meet them. Do I have, or am I likely to eventually have, mobility impairments? Do I have, or am I likely to develop, a medical condition that requires additional care or specific accommodations? What are my biggest concerns about aging? What can a senior living community do to address those needs? What have I historically found most frustrating or upsetting about my life or living environment? The past tells you much about how you’ll feel in the future. So if you get depressed when you don’t spend enough time outside, consider a senior living community that makes outdoor time easy. Do I have to commit to living here for a specific period of time? Are there any community rules that limit what I can have in my home or which activities I can do? For example, can I keep plants or fish in my home? Are staff available at all times to assist me? What do I do if I need rapid assistance? Is there transportation available to medical appointments? At virtually every age, financial stress can keep you up at night. When you’re on a fixed income or concerned about long-term health, financial concerns can be even more frightening. If you’re on the fence about moving out of your home, consider that a senior living community might actually alleviate some financial distress. You’ll have a much clearer picture of your monthly budget, because you won’t have surprise expenses like a burst pipe or a large power bill. You’ll probably spend less on entertainment and eating out. So ignore the initial sticker shock of all-inclusive living. Consider instead whether the price of a senior community is comparable to your current budget. If not, there may be options for affording an upgrade to a senior community. Some long-term care insurance policies cover senior living. You might be able to tap into savings. And of course, if you’re moving out of your home, your home is an ideal source of funding. Consulting with your family and a financial advisor can help you ensure you make a financially sound decision. You wouldn’t buy a house sight unseen. Don’t invest in senior living without visiting the community. Ask to see the unit that the price you’re quoted will get you, and don’t forget to ask about the price of upgrades such as more meals or a larger living space. Consider whether this community feels comfortable and safe. Do you like its culture? Do the staff and residents seem happy and at ease? Can you see yourself there? Is it close to the part of Atlanta you’d like to be in? What levels of assistance are available if I need them? What are the various meal options? What classes are available? What about relationships with local schools that offer programs for seniors? At Georgia State University, for example, seniors can audit courses for free. Is there transportation to local attractions? What about access to community activities? What is the community culture like? Do people tend to eat together or in their homes? Do most people volunteer or take classes? What is the emergency policy? How does the community handle intruders, floods, or fires? Is there MARTA bus or rail line access? Take a loved one you trust on your tour. A child or grandchild might notice things you miss. They can also help you ask engaging questions, and can give you valuable feedback on each community you tour. 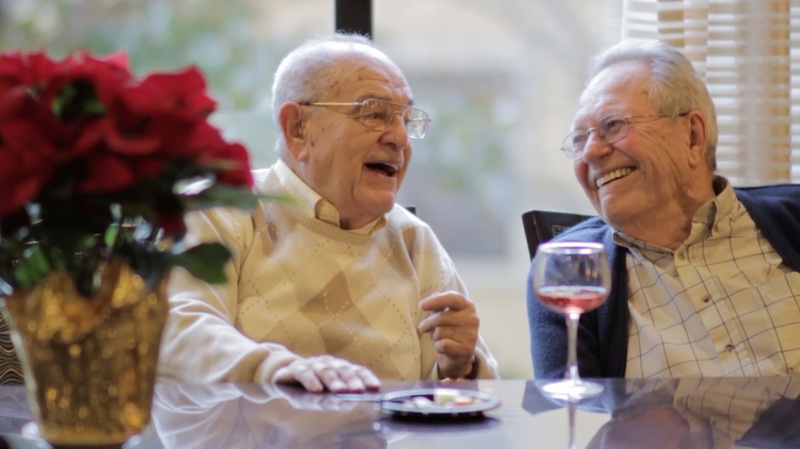 The transition to a senior living community should be exciting. Like all transitions, it can also be a bit scary. Consider how you felt at your wedding, or on your first day of high school. Some anxiety is normal. You should also trust your gut. Choose only a community that offers you something you can look forward to. And if a nagging voice in the back of your head tells you a community is not right for you, continue the search. Renaissance on Peachtree is situated in the heart of Buckhead, with easy access to MARTA, to museums and cultural sites, and to some of Atlanta’s most beloved restaurants. Our high-rise views and lush apartment homes offer help when you need it, and independence when you don’t. We can’t wait to show you what the next chapter of your life can look like. Contact Renaissance for the ultimate in Atlanta senior living luxury!